“I don’t think you’ll see many other bills out there that have this kind of diverse group (behind them),” says Kelly Ingebritson, a senior government relations representative at the Conservation Fund. She has led a coalition of diverse groups to advocate for FLTFA’s reauthorization over the past seven years. FLTFA funds helped protect a 160-acre inholding within the western entrance of the City of Rocks National Reserve, near Twin Falls, Idaho. FLTFA was first implemented in 2000, and expired in 2011. The program became an important conservation tool for the West, enabling the BLM to raise over $113 million by selling 30,000 acres between 2000 and 2011. The BLM, along with U.S. Forest Service, National Park Service and Fish & Wildlife Service, used that money to purchase private parcels inside or adjacent to the Canyon of the Ancients in Colorado, City of Rocks National Reserve in Idaho, Hell’s Canyon Wilderness in Arizona, Zion National Park, and dozens of other sites. Before 2000, the BLM had little incentive to spend precious staff time and resources to go through the arduous process of finding buyers for isolated parcels, since the revenue got funneled to the U.S. Treasury. FLTFA allowed the BLM to keep that money in a separate account for future purchases. The law also provides one of the only ways for the agency to remedy the West’s checkerboard land ownership, a byproduct of 19th century land settlement laws. Land grants to railroad companies and homesteading laws that provided settlers with dispersed parcels left a chaotic pattern of ownership. The BLM manages 246 million acres, which includes many isolated parcels inaccessible to the public and surrounded by private property. 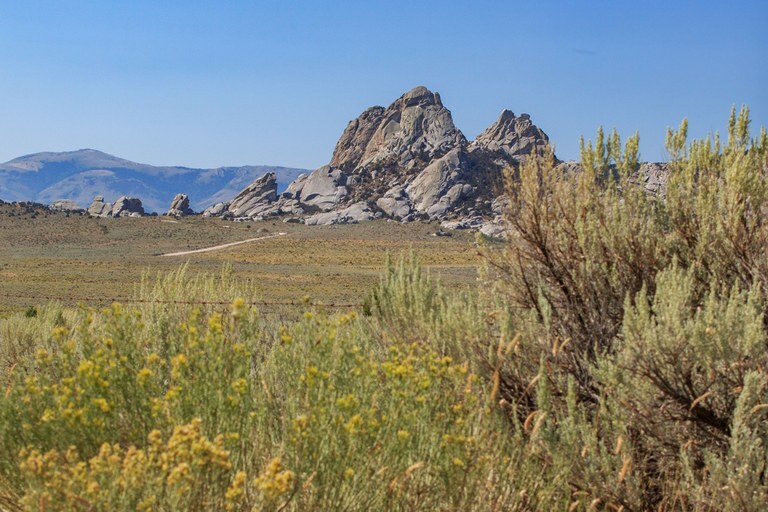 These inholdings can be a nuisance to manage because they’re difficult to access even for BLM staff, and are embedded in private lands whose owners aren’t required to follow the same management philosophy. These isolated public parcels can also be problematic for farmers and ranchers who own the adjacent land. The same is true when private property is marooned inside public lands. Land swaps are another way federal agencies are allowed to clean up checkerboard ownership. But swapping public for private lands can take many years and requires each parcel to be of equal value, which can make a fair trade hard to find. 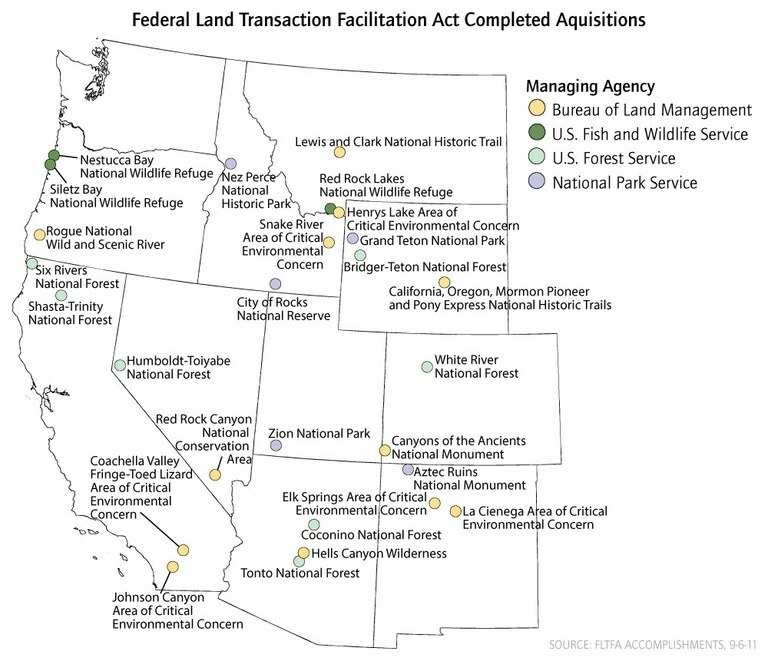 Land exchanges have long been controversial because they often lack transparency and open federal agencies to political pressures from private individuals or entities seeking particular parcels. It’s rare to have two parcels of similar value, and the valuation process can be subjective, favoring private landholders over public access and benefits. Proponents of FLTFA say the new program provides a much-needed alternative to land swaps. “It’s a clearer, simpler and ultimately more effective way to deal with the irrationality of land tenure in the West,” says John Shepard, senior director of programs at the conservation nonprofit Sonoran Institute. Land eligible to be sold under FLTFA must be identified through the BLM’s public processes for resource management plans. Proponents say the BLM and members of the public consider potential FLTFA sales in the context of the larger landscape, and whether they align with goals for the region. “As opposed to just saying, ‘I want to buy that piece of land and I’ll exchange it for this,’ (FLTFA) is much more formal, transparent, and divorced from any immediate transactional goals and objectives or pressure,” Shepard says. Land sales under FLTFA can also ease pressures around the West’s growing communities, allowing people to buy public parcels on the outskirts of metropolitan areas. By 2009, 78 percent of FLTFA revenue came from sales in Nevada, where the city of Las Vegas continues to eat up once-public lands on its periphery. Some proponents of FLTFA see the law as an important step to addressing that growing pressure for land sales. Bishop’s bill changes the previous FLTFA law to require agencies to use funds within four years of the sale, or forfeit that money to be used for purchases in other states. This provision would allow the feds to spread funds from a state with a disproportionate number of sales, like Nevada, to other parts of the West. Legislators have tried to reauthorize the fund in every session of Congress since 2011. Most recently, Sens. Martin Heinrich, D-N.M. and Dean Heller, R-Nevada, introduced a reauthorization that got attached to Alaska Sen. Lisa Murkowski’s massive energy bill that failed last year. Heinrich and Heller have also introduced companion legislation to Bishop’s bill, in the Senate. FLTFA proponents are now working to get the law attached to the 2018 fiscal appropriations bill, which Congress is required to pass by March 23.